Our Yankee friend Raven has had enough of politics at And Rightly So, and has moved over to her Just Raven site - whence the moose photo on the right. 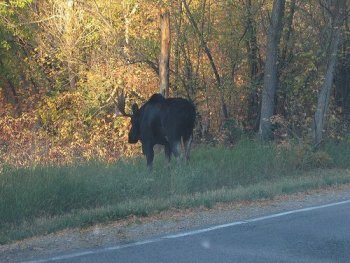 As the New England moose population burgeons, this is becoming a common roadside sight. Scary, too: you do not want to hit one with your Prius. A year or two ago I enjoyed a moose filet. Very fine. Hey students! Stay out of political "engagement" in our local politics. For Dalrymple fans, Decadence, Europe, America, and Islam, from a year ago. Mark your calendars for Nov. 15th.. "November 15th is approaching quickly. It is this date where supposed real valuations, according to accounting standards, have to be made on value-less class 3 assets. Thursday (November 15th) may go down in history as a financial reckoning day. Given the presently very shaky US markets, these revelations could very well precipitate a stock market drop--if not a stock market crash--led by the financial sector stocks. Category 3 assets refer to loans fully secured by first liens on one to four family residential properties and the revenue for municipal bonds. In other words the 10 billion already written off by Citigroup and the amount written off by Smith Barney were just the forst shoe hitting the floor�here comes the second shoe. Part of the challenge has to do with the Basil Agreement covering derivatives. The Basil agreements, without going into mind numbing detail were failures at helping to define the true values of derivatives. The 1993,1998, and the 2006 Basil Agreements contained a lot of �white noise�, masking the true valuations of these derivatives. Thursday we will get closer to the true dimensions of the economics in play. Dig a hole. Everybody is keeping their powder dry for buying opportunities.